The great majority of traffic signs can be equipped with the LED Box. 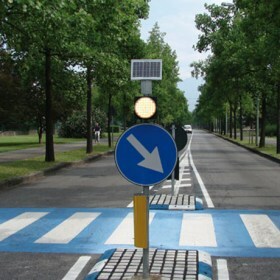 The LED Box can be mounted on top or below the traffic signs depending on their shape and type. The LED Box is a new solution that can be implemented in existing traffic signs and poles reducing the total installation cost. 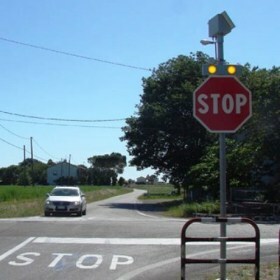 It is suitable for installation in STOP signs and specially in places where traffic signs are violated, resulting to significant decrement in accidents. The LED Box is available in four (4) different versions. It can be powered by 230VAC or by a suitable photovoltaic system for autonomy and energy saving. Led Box with Single flashing light of 200mm diameter, certified by EN 12352-LH8. Recommended to be used with photovoltaic kit of 5W. Led Box with Double flashing lights of 100mm diameter, certified by EN 12352-LH. Led Box with Four flashing lights of 100mm diameter, certified by EN 12352-LH. Suitable for installation in roads with bidirectional traffic. 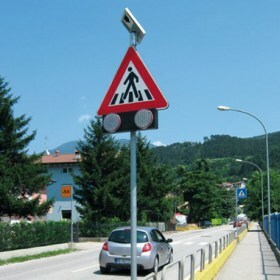 A flag type mounted traffic sign is required to be used with the above LED Box. Recommended to be used with photovoltaic kit of 10W. Led Box with Double flashing lights of 200mm diameter, certified by EN 12352-LH8.